Minneapolis: University of Minnesota Press, 2011. Thomas Waugh is a senior scholar in documentary studies who has focused during his entire career on left-wing, dissident, and activist film, which he groups under the term “committed” in the introductory essay from Waugh’s now-classic “Show Us Life” (Waugh, 1984), which also opens this volume. The essays span from graduate school term paper to distinguished-scholar conference keynote. University of Minnesota Press’ Visible Evidence series has performed a service to the field in publishing this collection, which includes both previously unpublished and published work. Documentary studies scholars have struggled to develop beyond textual analysis to analysis of documentary process and socio-political significance. The field is still evolving the analytical tools and theoretical approaches to understand the relationships between culture, society and politics. The fields of cultural studies, anthropology and sociology all have developed critical lenses through which to consider behavior and process, in ways that may allow future documentary film scholars to walk even further away from the tunnel vision of textual analysis. Meanwhile, Thomas Waugh’s work, while textually anchored, has consistently engaged this challenge. At least two of these essays provide revisionist perspectives that could and should influence future scholarship. Waugh re-envisions Dziga Vertov’s career, arguing controversially and importantly that Vertov’s early work in Man with a Movie Camera (Soviet Union 1929) is over-appreciated while his later sound work is under-appreciated, which is probably linked to valuing Vertov more as a modernist than as a revolutionary. (The text is largely left as it was, focused on the films and Vertov’s goals, not much discussing Vertov’s unenviable choices with shrinking resources as the Stalinist state relentlessly undercut him.) This essay was, astonishingly, produced for a graduate-school course – it was also an Oedipal stab at his then-professor Annette Michelson – and never published until now. “Sufficient virtue, necessary artistry” offers an extended analysis of work in the 12-year-long Challenge for Change/Société Nouvelle project of the National Film Board of Canada. Waugh looks closely at the fluctuating relationship between political and aesthetic objectives in the teams that executed the work, calls for re-release of much dormant work, and challenges a critique of the project by other academics who claimed that the work was too embedded in status-quo, governmental mandates to serve real social change. Other essays provide solid discussion material for both students and scholars. His essay on Heart of Spain (USA 1937) and The Spanish Earth (USA 1937) provides a historical and political context for the aesthetic choices made in those left fundraising films. An extended essay on U.S. self-styled radical documentarian Emile de Antonio merges three works from different points in a career in which Waugh has consistently championed de Antonio’s work. His culminating essay links the work of Joris Ivens, the subject of Waugh’s own dissertation, and later activist filmmakers. Waugh has earned a reputation as a leading voice on gay-lesbian-transgender-queer documentary. He includes several essays on performance and performativity in documentary, two of which concern a subgenre that emerged in mid-career: these essays are particularly self-conscious and reflective, and also serve to map entire bodies of work (primarily but not exclusively in North America). He documents in the prefatory reflections his own public emergence as a gay man, as well as the rapid evolution of the movement. Perhaps the weakest essay in the collection concerns independent documentary film in India. The essay is short on contextual information on the production conditions of the films, the social status and location of the makers, and the location of such works within Indian media culture. It has been critiqued before, by Chon Noriega (University of California, Los Angeles), for simplistic analysis depending on West/East oppositions; that problem continues in this somewhat revised version. At the same time, the essay provides a scholarly record of significant work that circulates poorly in some educational circles and certainly those in the U.S. The work as a whole, like documentary studies in general, focuses sharply on the films and Waugh’s critical analysis of their implications; there is some but little information on the reception and use of these films. Thus, context tends to focus more on filmmaker intention and to explain stylistic choices than on effect or use. Of course, it is a serious challenge to measure effectiveness, other than distribution or critical reception, neither one of which indicates much about political or social impact. Perhaps the era of social media will bring better ways for scholars to do network mapping, revealing use patterns that link to political behaviors. As well, the essays do not always provide political context to understand the sometimes tangled relationships and issues within dissident political movements, and to assess the significance in the wider society of those movements. So the relationships between filmmakers and the movements they interact with or, sometimes, serve are not always transparent for the uninitiated. Waugh holds committed documentary to a not-quite-articulated political standard, which seems to evolve with the attitudes of liberal-left professionals in North America. He expresses relief that conservatives have not historically made many documentaries. But this now is a time in which highly committed, extreme religious and right-wing groups are busy making documentaries to spur mobilization. It is also a time when it is difficult to identify a left-wing pulse in U.S. political life nationally. In Waugh’s work, the term “committed” often leaves vague exactly what filmmakers are committed to. The realities of left-wing politics are not always sketched. The work is nearly mute, for instance, on the profound influence and fatal limitations of international Communist Party funding and policies on documentary production. The shift in the North American left away from broad-constituency efforts around labor and political parties to identity politics movements that then had to grapple with the dangers of victim politics and balkanizing of political movements is not discussed, but this shift changed constituencies, political action and cultural expressions. As Waugh himself notes in his prefatory musings, one era’s political correctness becomes another era’s insensitivity; his early essay on gay and lesbian film is later critiqued by movement activists who call themselves queer and wonder where his acknowledgement of transgendered people is. Waugh’s graceful explorations of “committed” documentary sit at the edge of furious critical cultural discussions on how to understand the relationship between political and cultural expression. The work of cultural studies put in motion by Raymond Williams and later Stuart Hall, of sociology inspired by Pierre Bourdieu, of philosophy drawing from the work of John Dewey all engage the challenge. And it is a challenge. The political realm, where power over natural and social resources in a society is allocated, functions unsentimentally and often brutally – even when it is democratic and inclusive. Cultural expression overlaps with that realm but also functions outside it; it is a cliché but also true that political art is to art as military music is to music. Charting the relationship between socially-engaged art and political life more fully, in documentary as elsewhere, drawing upon thinkers far beyond the realm of documentary studies, will require fuller discussion of the political realities than happens in this work, and a clear articulation of the distinction between those realms. Such analysis could make sharper the terms of future discussion on the significance of the Canadian Challenge for Change films, those of Joris Ivens, or those of gay activists in different eras. More explicit discussion of political realities and of relationships between films/filmmakers, constituencies and political projects will also minimize the ever-present dangers of making facile and even sentimental relationships between topical cultural expression and political life, of over-claiming for work on topics friendly to the critic’s sensibilities, and of collapsing politics and culture. As well, it could make it easier to have meaningful conversations, scholarly and otherwise, about the work with people in other generations and places, and of other political beliefs. Thomas Waugh has built a platform from which future work on socially-engaged documentary can develop. He has done so in a warmly personal voice that allows readers to understand his work as a product not only of his time but his person, someone who has continued to grow as he has continued to contribute. Waugh, T. (2011). 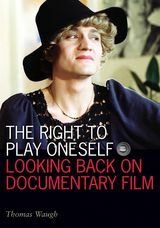 The right to play oneself : looking back on documentary film. Minneapolis: University of Minnesota Press.